If you were following my recent trip to France on Instagram or Facebook, you might have seen my photo of a luscious cantaloupe soup I had as an appetizer one evening. I said I wanted to try to recreate a version for breakfast. When I got home, a copy of Karin Hehenberger’s new The Everything You Need to Know about Diabetes Cookbook (affiliate link) was waiting for me. Guess what? The book includes a recipe for Cold Melon Soup with Ginger! The CompostMaster and I love this soup so much, we made it twice in 10 days! The second time, our niece (age 5) helped by grating ginger and loading the blender. Cantaloupes, especially local ones, are super-sweet right now. As a soup. Pour into bowls and garnish with mint. It’s a great first course for lunch or dinner. As a beverage. You can thin it with a little water if it isn’t pourable. Makes a great afternoon pick-me-up or breakfast drink. As a sauce. (This is my very favorite.) Add some to a bowl of cottage cheese and blueberries for breakfast. You’ll get a boost of protein from the cottage cheese. I’ll review The Everything You Need to Know about Diabetes Cookbook next week and you’ll have a chance to win your very own copy. In the meantime, enjoy this cold melon soup! This soup is amazingly refreshing. Not only is it low in calories but it also has the additional benefit of containing ginger, which boosts the immune system. Put the melons, oil, ginger, and fleur de sel in a food processor or blender and blend until smooth. 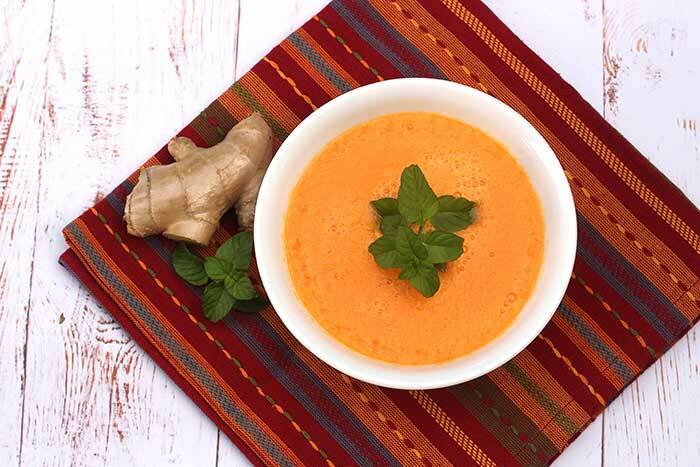 Pour the soup into bowls and garnish with strips of fresh ginger and mint leaves. Fleur de sel ("flower of salt") is French sea salt. It is very delicate and dissolves instantly. You can get it from amazon.com (affiliate link) or use salt you have on hand. I’ve just found your site and I’m thrilled to find more healthy recipes. While I’m the only one doing strictly KETO I see many recipes that the whole family will love and are KETO friendly at the same time. I appreciate that you give us nutritional information and the number of servings. You’d be surprised how many give nutritional facts for their recipes but fail to mention the serving quantity. I do have a query for you though. For example, in this recipe you state the ingredient as two cantaloupe melons but give no gram, ounce, cup or pound measurement for the amount of flesh used. How do/can the carb, sugar, etc. grams be accurately calculated? Are you figuring approximately so many cups, ounces or grams per melon? Cantaloupes come in a variety of sizes, as do most melons and fruits. How do we know if you mean small, medium or large? And for cantaloupe and honeydew some have few seeds while in others they abound. Could you tell us approximately, as close as possible, how much melon or ingredient is used in the recipes? I know I’ll most likely have to figure my macros independently but having a better idea of quantity used would help greatly. Thank you. Hi DJ – Welcome! I’m happy to hear you’re finding recipes your whole family will love. This particular recipe was reprinted from another source, but you make an excellent point. I’ll try to be more accurate in the future.